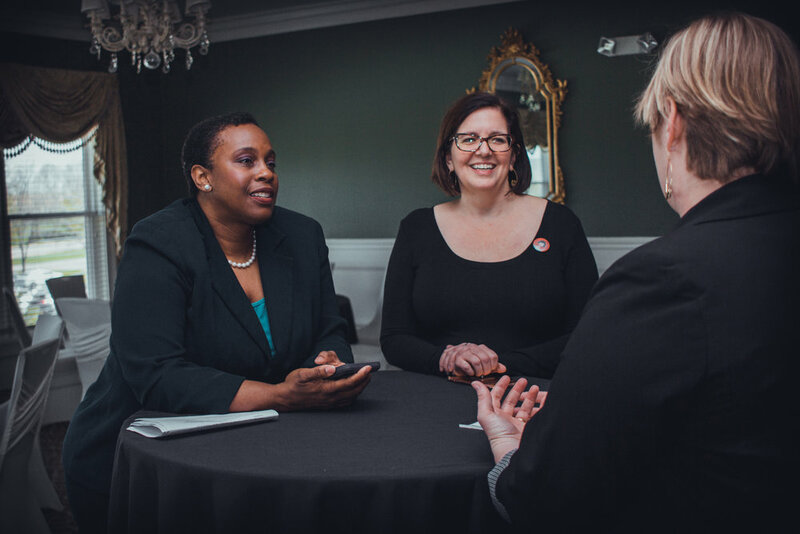 Roughly seven months after we last talked with Megan Park, we spent a beautiful April morning at the Ivy Hills Country Club catching up with the producer and storyteller and experiencing her project Putting Women in Their Place in action. Putting Women in Their Place is a project that produces campaign videos for progressive, pro-choice women running from office. We met with Megan – in the midst of shooting videos for several candidates – to catch up on her many exciting projects, motherhood, and more. Interview by Abbey Bruce. Photography by Yashira Afanador. We launched Putting Women In Their Place in September 2017, and since then, we have created 43 videos over an 8-week period in four states. The response has been overwhelming and positive. I wanted to see if this would work, if people would latch onto this idea, and they did. So, I said, “This works. Let’s keep going.” We are launching a thousand video campaign: 20 videos, for 20 women, in all 50 states. We are at the difficult place of finding investors. I realize that this needs to have some investment behind it, so we can grow in the way we need to. Even though we are offering these videos free of charge to the candidates, they’re obviously not free to make. I have been constantly working on fundraising. That’s hard. That is a space that I have never been in. We just launched a crowdfunding video. We hope that will get a lot of nationwide feelers out. Video provided by Putting Women In Their Place. Speaking of “Common Goals,” what is the status of that project? We teamed up with the women in the Junior League, which spun off this nonprofit called Refugee Connect. Refugee Connect connects over 100 refugee organizations in this city. That is more than two people per neighborhood. They help people find services that are out there specific to each population. Refugee Connect has been very supportive and introduced us to more people – adults that came here as children and who can speak to that experience: what it was like for them and what it means now to be an adult and a contributing member of society and not [be viewed as] a terrorist or whatever fears people have. It has been a great alignment. With Putting Women In Their Place, what are some of the biggest races you are helping to cover? I always thought that this was going to be a down-ballot project where we focus on the down-ballot candidates, which we still are. Governors haven’t called, and Elizabeth Warren hasn’t called me yet, but we have had a lot of congressional candidates sign up. We wait for the candidates to come to us. I am not calling people and saying, “Your race is a big deal. I want to help you.” I have had a hundred women sign up from 20 states already. I haven’t had to source yet, but I will if I want to hit this thousand candidate mark. I think this summer is going to be crazy busy. Has your perspective changed since your last interview with us? I am spending a lot more time fundraising than I thought that I would. That is not my natural area, so that has been a lesson. My perspective has also changed on politicians. I grew up jaded in my opinion of politicians. These women that are running are doing it for all the right reasons. They want to make a change and they are tired of being ignored. I feel like the reasons they are running are the same reasons why we take a casserole to the woman down the street that had surgery or why we volunteer for the PTA: “I have a really good idea, or I want to make things better.” That is what every woman tells me time and time again. It just reinforces that I am doing the right thing by amplifying these voices. Their hearts are in the right place and that is so genuine. You are creating media that makes people think, and makes people act. What media has the biggest impact and inspires you? I love documentary films. I went to Sundance Film Festival in January, which is my happy place to promote Putting Women In Their Place. I wanted to meet filmmakers from all over the world, and Sundance was a great place to meet them. I got to see tons of documentaries. They fill me with wonder and make me feel like a total hack. I grew up in a time where parents were saying, “Just wait until you get older and then you can sort that out.” It was always a time in the future that I would know myself better, or have better ideas, or understand myself completely. What are three films that have had an impact on your life or challenged you to think differently? I loved “Lady Bird.” That was such a beautiful script and such an honest telling. “Thelma and Louise” really impacted me, too. It was one of the first movies of powerful women who took their lives and did their own thing. As the mother of a young preteen woman, how do you empower your daughter and instill those values of feminism that are so important to you? I really listen to her and trust her. I think that is a scary thing for adults to do. She is very different from me. Her mind works differently; her passions are different. I just have to trust that she knows herself, and she really does know herself in a way that took me years to know myself. I grew up in a time where parents were saying, “Just wait until you get older and then you can sort that out.” It was always a time in the future that I would know myself better, or have better ideas, or understand myself completely. I had to throw that out and say, “She knows herself really well.” When she tells me that she needs to do something, eat a certain food, or go to bed at a certain time, I must really trust that. I want her to trust that the words that she says are heard and validated. I think that is something that all feminists want. Now looking forward, what advice do you have for the future women of Cincy who are wondering what their potential may be? How can they plug in and change the world? I think this city has amazing networking opportunities and is an amazing philanthropic community. I think it is a very passionate city and very easy to tap into. As a newcomer, I found my tribe easily. Don’t be afraid to ask and take advantage of things offered to you. Most people are genuine and do not offer things they don’t want to give. Accept the gifts. Visit www.puttingwomenintheirplace.com.to learn more about how to sponsor or contribute to Putting Women in Their Place.